I think that San Diego should have been wearing brown socks. I didn't like the fact that both teams were wearing yellow socks. Guessing that's a San Diego Freudian slip, since the Padres are going back to brown. Their helmets and their primary jerseys are a shade of brown, aren't they? Anyway, whatever you want to call that colour, that's the colour the socks should have been. Yeah, @Ferdinand Cesarano, you may wish to examine the color settings of your monitor. This isn't even a Buccaneers pewter-looks-like-brown thing. The Fleet wear battleship gray. Appropriately enough. Their helmets and their primary jerseys are a shade of brown, aren't they? No. The team identifies the color of the helmets and primary jersey as Battleship Gray. The Fleet wear battleship gray. If they went with a "Marine Corps" third brown/yellow could work. How old are you? You might want to get your eyes checked for cataracts. They can make things look brownish. Ok. Second time I’ve had to say this. Keep this thread focused on the uniforms and logos of the AAF. If you want to talk about the business side of the league? Go here. Am I a hypocrite for hating the look of the Rams and NY Giants navy blue and royal blue "classic" uniforms, but liking the Commanders' use of maroon and bright red? I think the contrast is better with royal/navy myself. That being said? I hated the Commanders’ look when it was unveiled and now I think it looks sharp. 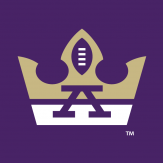 The weakest identity in this league is Salt Lake’s and I’d still take it over the Bucs or Seahawks’ identities. The Commanders are a sharp looking team. It’s an original for sure. Like it pays homage to Texas A&M Maroon and Texas Tech Red w/silver pants. If the NFL ever adds San Antonio they already have their uniforms and nickname. Perfectly fits the city and Texas as well. I'll just say this. If this is the end of AAF, I hope the Arizona Hotshots name and branding lives on via another pro team in the state. Looking at you Northern Arizona Suns. Of all eight teams, San Antonio is the only one whose location, logo, name and color combination I’d like to see carried over to an NFL expansion team. For me, it’d be the San Diego Fleet. The location is a no-brainer, and the name itself is stupid, but the uniforms and color scheme were amazing. It deserves to love with a halfway decent Navy name, even something like “Destroyers” or “Cruisers”.